CZ Hammer Coach Gun N.I.B. Description: This is a used (Like New) (Less than 75 rounds through it) CZ 920 Semi-Automatic 20ga that has a 28" barrel and has a 3" chamber. It has a Blued finish with a Turkish Walnut stock and forearm. 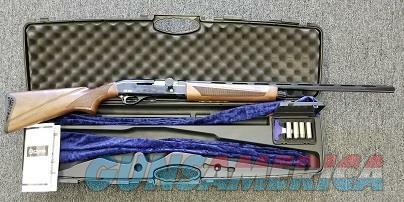 This shotgun comes with 3 chokes, wrench, choke plastic hard box, Hard Case with cloth barrel and stock sleeves, manual, and original box. Customer took it Dove hunting one time. There are no handling marks. Additional photos are available upon request. YOU MUST SEE TO BELIEVE!! The CZ 920 is a 20 gauge semi-automatic shotgun. It has a 28" vent rib barrel with a 3" chamber and weighs approximately 6.4lbs. It comes in a high gloss black finish with a wood stock. This price reflects a 3% cash discount. You may use Credit Cards but must add 3% to the total. Our payment policy is, we need to receive payment by online payment or other arrangements within 48 hours after your commitment to purchase regardless of the website rules. I DO NOT TAKE RETURNS UNLESS OTHERWISE AGREED UPON. Please make sure what you are purchasing is legal in your state or that you are sure you wish to purchase this item. There is a 20% restocking & relisting fee for any guns purchased that you either back out on the purchase after payment or that are not legal in your state or have to be returned due to a failed background check. All warranty issues must be done by the manufacturer for any issues or defects. Florida residents must pay Florida Sales Tax of 6%. An Additional fee of $50.00 for California sales will be invoiced after order is placed.